BBcreams were launched in India around more than an year ago and Ever since, Maybelline exposed the consumers here with the concept of BB creams by launching their own version and the very first in India Of course, their popularity has been on the same level and apparently have growing tremendously! They can range from less than 69 bucks upto thousands and there is one for every one out there, depending upon the need, budget and may be skin type as well. Now, we have powder creams as well. Remember Glam up powder cream. Let’s see what BB’s creams are? BB actually means Blemish balm or beauty balm. They were originally made by a German dermatologist to help protect patients’ skin who have undergone surgeries. Then Korean market started selling these BB creams as a multipurpose product that can work like sunscreen as they has some SPF, moisturizer, primer, foundation and concealer that can give you a flawless looking skin in just one step with only one product. There are so many popular brands in Korea that manufactures BB creams and they are Missha, Skinfood, Skin79, Leneige, The face shop, Etude House etc. 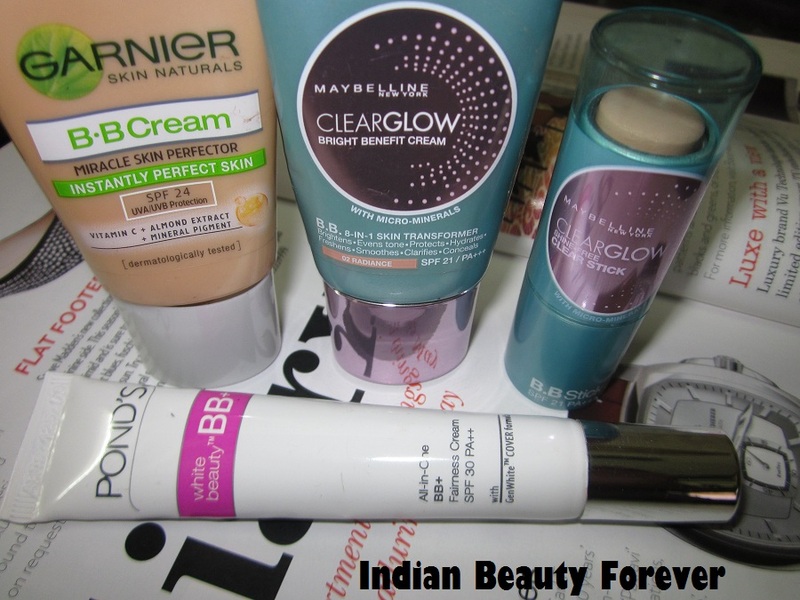 In this post, I will sum up affordable BB creams that are available in India and their Price. So, that if anyone of you, wants to know about them, it can be a help. :D You can click the links to read more about these. Maybelline Clear Glow BB cream- This was the first BB cream that was launched here and it comes in three shades Radiance, natural and @ude. Priced at 199 INR. I tried it when it was launched and the experience at first, was a shock!! Since, when I applied it , it made my face look almost white and I was about to go and wash my face but with little blending and the fact that the ashiness goes after some time, it matched my skin tone. Relief!! :D It does provide moisture, has sunscreen and even tones the skin, giving it some sheer coverage but the only problem is that it is thick and if not blended well it can make you ashy. So, be careful on that! In hot and humid weather, it melts and also can be a bit oily for oily skin during summers. However, I have this feeling that this BB cream is very similar to the original Korean BB creams as I have used Skin79 BB samples but that didn’t melt as much like this.Then there was a new version called BB stick. Garnier All in one Miracle perfector BB cream- This was second one, which was launched long after Maybelline. It comes only in one shade but two different sizes a trial pack for 99 INR and a bigger one for 199 bucks. I used it a lot until it was summery, hot and humid as just like the previous one it was getting greasy on my combination skin. So, it may be good for normal/dry skinned people. It is not as thick as Maybelline but yes gives sheer coverage and even tones the skin. Blending isn’t that difficult though only one shade for everyone is just not fair as I find that the shade that they have launched, will suit fair to medium skin tones and on dusky people it can look mismatched! Pond’s BB cream- This is the current one I am using priced at 125 bucks and trial pack at 69 INR and I should say that even though it has only one shade but has prominent yellow tones to it which makes it better to match Indian skin tones than rest of the creams out there. Again, only one shade to choose from. How could they do that? I really wish it had some other shades. If you are fair to wheatish you don’t have to worry about blending it so much as it won’t leave you ashy like the other two. It isn’t thick and easy to blend just like a foundation n with sheer coverage but it also makes me feel that it is more like a tinted moisturizer than an actual BB cream. So, if you use these creams for even toning the complexion since, you don’t want to use foundations everyday or you are a college going student then these BB creams can be suitable for you! Most importantly, it is not as greasy as the other two which I think makes it a better choice for oily skinned people during summers. L’Oreal Paris true Match BB cream- It was launched recently, priced at 550 rupees and the best thing is that it comes in 3 different shades like Ivory N1, Gold G2 and Honey G1 and I am hoping this time even girls with darker complexion will get a close shade match as Gold appears really dark which is good as when it will be applied the color gets a little lighter and hopefully will match. I have not used it yet. I am looking forward to it! Revlon Photo ready BB cream- It also comes for 550 INR, comes in three shades, Light, Light/ medium and a medium shade with an SPF 30. BB creams and here to stay and soon I think more varieties will be launched. Let’s see what comes up next. I am looking forward to try the other two now. Great products! I love the Garnier one. I like garnier too but during winters. 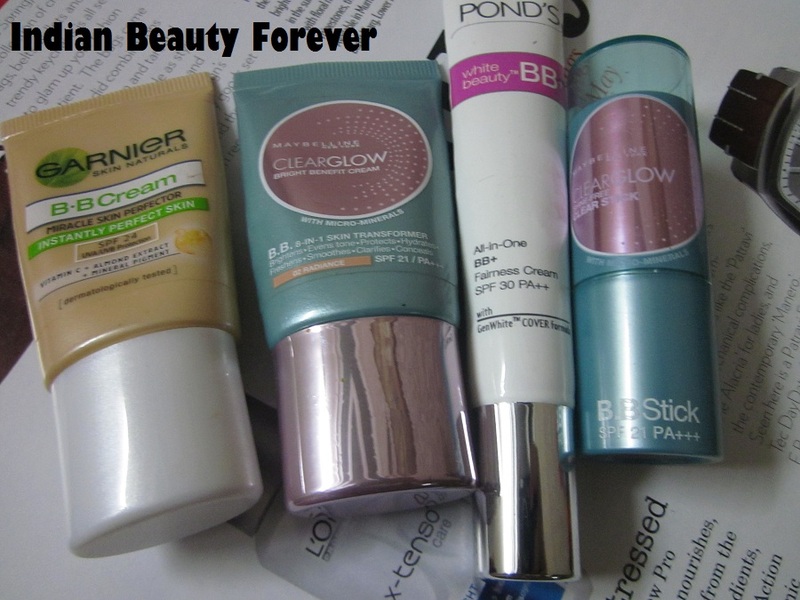 Nice compilation, will try Ponds BB Cream soon. Thank u Subha! I hope u like it! Nice detailed and very informative post Niesha. My fav one is Ponds BB+..
Too good for the price .. I have tried most of the brands but sad to say none fitted my skin. These products are good in terms of protection but the shades are somewhat more for those with fair skin. That said, the next to be tested with be Skinfood and lets see if the shade can blend into my skin color. I agree with you Navaneetham, they are really good, product wise but most of the shades are for very fair to fair skin tone and due to this medium to dusky skinned people can't really go for them. I hope skinfood suits you! I tried Gariner for my combi skin during winters and it was okay but then in summers it makes me greasy too! It can prove to be better for dry skinned people. Thank you Meghu! :) same here. I like ponds and lakme cc better! brilliant post and very informative ! I hv used L’Oreal true Match BB cream and I find it better den Maybelline. I m looking forward to try L'Oreal ! Thank you Urvashi!! same with me I like ponds too and Lakme CC as well! I m using them alternately! I want to buy the maybelline stick one! Looks nice. I usually use it for touch ups. Stick it really good for touch ups and it's easy to use than the liquids. I m also interested in Revlon. very beautiful post , you explain pretty well !!!!!!!!!!! !